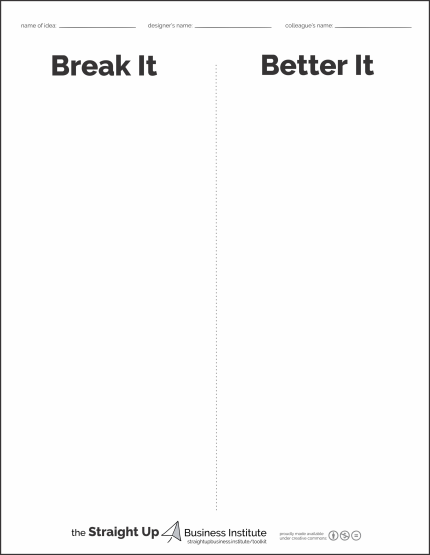 What is the ‘Break It and Better It’ form? As tools go, this one’s ridiculously simple – two columns on a piece of paper. But as process and mindset go, it can represent an eye opening shift. Most of us who think we might be on to a good idea will (at some point) ask the people around us what they think of it. And while there’s nothing wrong with that, it’ll rarely provide the results you need most to make it better. Whether you’re starting something new or working on an existing product or venture, the Break It and Better It form and process are designed to provide you with a simple and powerful first step in becoming an expert on your own idea. And it’s deliberately complementary to the Idea Napkin, the Idea Model, the Value Proposition Wheel, and other tools such as the lean and business model canvases. There’s nothing like sharing your idea with others to move it to the next step. Yet, many of us hesitate to do that. Even months or years since they day we cooked it up. And those that do share it often go about it in ways that are much to “safe” to yield the feedback we need. Take this simple first step to getting it out there. We all love our own ideas. And all of our friends and colleagues love us. (Okay, maybe not all of our colleagues…) And in general, people aren’t really very good at providing feedback. So while asking the people around you what they think of our idea can feel productive, it’ll rarely gets done right. This simple tool guides the way on that. There are all kinds of experts out there. And while you do want to find them on your journey, you need to remember three things: 1) none of them is an expert on your idea; 2) none of them is going to become an expert on it; and 3) only you can become that expert. Use the Break It and Better It form to get started.